Kienan" I said. She replied, slightly amused "They're all Corgi people"
Cathy and her dogs came over tonight to watch a DVD. We started off with all dogs in crates and then we let Jesse hang out with an open door, then I let Trek out, but Yoshi started to growl with Trek wandering around checking out the other dogs (Funny what a trigger Trek's interactions can be for him - possessive guy). Every so often we would do LAT but then I would go and hang out on the sofa with the humans to watch the DVD and he was content to crash in his crate. Eventually we let Jesse come out of the crate and up on the sofa and Yoshi watched this carefully, but did not object. As they got ready to go, I put Yoshi's leash on and let him out and had him do some hand targeting (the other dogs were behind the sofa out of sight but still in the room, then I sent him into the crate and treated him generously (they walked out of the house at this point). I let him go check out the dog beds and crates that were still there and he immediately plopped down on one, but I got his interest again by having him go back to the crate and get rewarded handsomely. He seemed happy doing this and we'll have to do this at agility class on Friday. I was letting Yoshi look out of the living room window just to see where we were at with that. About the same, if it's a person I can reassure him and he'll settle down. A cat was then standing on the front lawn and I was almost able to get him to settle and watch it but them a dog walked by and he just lost it. As I'm holding him and covering his eyes while he's beside himself with barking, Terri dryly chimes in "I think he's over threshold." Laughing I ask "Really?" She replies, "Yeah I think I'm starting to get the hang of this." Went to Kevin Gast's memorial service later today. There were a lot of agility people there mostly from Ace Dog Sports. Loni and Sandy both had really insightful and moving things to say about him which I'm really glad they were able to hold it together enough to do. I found another open space to try to walk Yoshi in. It's in Walnut Creek called Lime Ridge Open Space and the photos look perfect - far reaching sightlines. Dern it - that website said that it was good for dog walks, but when I got there it was very visibly posted No Dogs. Hrrumph. So we had a nice walk though a nice nearly deserted neighborhood still with great sightlines, and the we had a second walk in a huge field that turned out to be a part of Safeway's corporate building. It was great except for all the foxtails I had to pull out of his fur. But I don't need to drive to Walnut Creek for this as can probably find similar things closer by. I actually haven't entered Trek in further agility trials and I'm feeling remiss, but i want to do her tear duct closure surgery first I think. Yesterday Yoshi and I were watching dogs from the dog park parking lot with him in his crate and me tending the treat bar. criteria based on what he can give you. Agility Class for Trek and Yoshi. I'm bringing goodies to celebrate Trek's great weekend. It was sprinkling a little and kinda breezy, so the dogs were not behaving typically and Yoshi seemed a little nervous so after playing a little LAT we retreated into an ex-pen to sit and watch. He was a little bummed not to be doing a lot of LAT and was after my pockets a fair bit. I would do it a little with him but I mostly wanted him to relax and when the treats are out he's not relaxed. He settled a little but not really and always kept an eye out on the activities. We were right in the middle of the activity and would have backed off more but it was raining so we stayed under the canopy. It was ok, not perfect, but fine. Trek did well. At first was skipping weave poles (popped the 10th one again and no excuse of something visually weird right at the end. Finally got her to do them properly, then we went to the upper field and later revisited them intending to work on them and then of course she did them perfectly in both directions. She was hesitant at doing a serpentine of jumps but the ground was really slick on the lower field so I wasn't doing the handling very well, but I still should do more work on rear crosses. In the upper field she did great, even was able to do a dogwalk "right" tunnel the first time which happily surprised me. She readily went into tunnels without first checking for lurking Cardigans, and I kept my "tire" and "tunnel" lines straight and said them on time which helped a lot. Also did a lead out where the choice was to come to me and then go into the far side of the tunnel instead of ducking into the near side of the tunnel. She did this great twice. I stacked the deck in my favor by having a treat in the signallling hand. Yoshi to the park to watch dogs coming out of the dog park. We stayed in the parking lot and he stayed in his crate. I'll ask CU_Dogs about LAT vs just feeding him. Leslie further clarified that her observations are a way of determining if he's ready for a criteria increase. a crate but you can still use one, and i have. charging into his crate when I ask him to (a Go To Place style thing). hard shell varikennel, but probably not a wire crate (too open). certain distance, dog remains on mat until he hears the verbal release to move off it. is an environmental signal that you have food. Diane is asking if I can go over some clicker basics with her. No problem. I did explain that I can't afford to be a professional dog trainer since as a computer professional I make a whole lot more than most trainers (which is a sad commentary on our society that my screwing around with bits of silicon and plastic are more highly valued), so I don't take money for it - we'll work a trade of some sort. Husky as he doesn't care for them and the way they carry themselves. (he's good about this for a Corgi) or is he chomping on my fingers too? think I'd ever see again. like a new dog walking into class). He's getting it. We now can walk down the fence line with the sheep. Sometimes we drift away from the fence but for the most part we do get there. We now need to work on penning and holding the sheep back while I open the gate. Completed the mini movie of Yoshi doing LAT and me using a clicker. We also got some footage of him being over threshold and not responding to a click, then backing off, and then him able to respond. Despite 4 zoomies filled runs, Corgi Trek went 5 for 5 Qs today at Bay Team CPE. The one where she didn't decide to go on a world tour, she won the class (the Standard Class). Good doggie. There will be goodies of some sort on Friday. A twofold important day for Yoshi. For one we're going to be filming him playing Look At That at the agility class he usually watches, and then when we're done with that we're going to try him at a few agility runs in the same class. The filming went great and I will have to edit it into a small movie that I will put on You Tube. Before he ran I handed some citronella spray out just in case the unexpected worst happened and he jumped one of the dogs. Fortunately we didn't need it. His first run was great. The next one at some point he heard one of the other dogs squeak and looked right at it seeming uncertain and stressed. Pushing him went he's like this is how that [bloodless, but so not ok] attack on the Border Terrier happened so i immediately picked him up and carried him off so we could end on a good note. After class, he did have an emotional outburst - I'm not sure if it was at the puppy he was meeting or the husky he's uncomfortable around, but I should have cut the interaction off sooner. With the above in mind, we went over to the dog park with treats in hand. This time we parked not right by the fence, but in the next row over. This was done mostly because by the fence was full but it worked out well as then he got to see lots more dogs nearby going to and coming from their cars. I opened the crate door and we started to play LAT until a dog was about to walk by them we mainlined the treats. He did try to react a couple of times at passing dogs, but not violently. I basically shut him back in the crate, and stopped the treats for a few seconds until he appeared more comfortable, then we started up again. This is the level that we'll need to stay at for a while. Pretty easy work for me, sit around and feed my dog treats (well I do have to prevent him from launching out of the car.) in general he's doing very well at it. Took both dogs to the dog park to train Yoshi and to let Trek race around off leash there. Trek likes the open space of the big dog park to run around in (she seems to feel cramped in the small dog park). I worry about her as I don't want a big dog to start picking on her or thing she's prey so I only do it when there aren't many dogs. Even though she gets along with all dogs, it's mostly because she dosen't really care about them much at all beyond Yoshi (or just about any male Corgi who wants to play.) But she enjoys racing around in the open space. While Trek hung out in a crate I backed the Scion up to the fence of the small dog park and Yoshi and I played the Look At That game with him in his crate. This turned out much better than expected and I made a short movie of it here. He could tolerate a small dog racing up to the fence to say hi. He was in the car about 10 feet away in a crate. I'm so happy with him and now I'm trying to figure out what his next step should be. [later] Elf tells me that the oranges could be caused by Roof Rats - I hope not - they used to be here but my neighbor had them exterminated. They certainly could be back but I have not seen their ghostly nighttime shapes of late. One a different note, the Calif DMV is being bureaucratic and tells me I can't directly transfer the AGLCRGI plate from the truck to the Scion as the truck is commercial and the Scion is residential. Please. How hard is that really? But it turns out that they did me a favor as I was thinking if there was another plate that I could come up with that wasn't taken. I was trying to figure out how to get HRDNCRGI down to 7 letters, when one of our old agility DAM (Dog Agility Masters) team names came into my head: THE CORG. Oh surely that's taken, it's too good. Turns out the Corgi people who buy anything Corgi related, were asleep at the helm (and "Prepare to be herded" Den, who undoubtedly has it, lives in another state :) It was available and the Scion gets it! WaHoo. Now I need to get a Corgi decal for it as a way to help people figure it out. That's to go along with the Matchbox [car] decal that it needs. 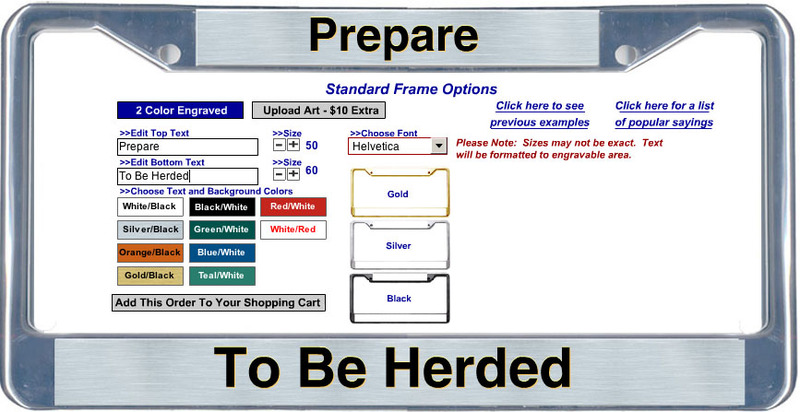 Oh and it would be great to get a license plate frame that says Prepare to be Herded. I'll have to tell Den that I'm going to steal it. Oh and since we actually going to let Yoshi try running courses in the 6:15 class, out of prudence, I ordered the Citronella Direct Stop from Clean Run. Agility Class - Yoshi watching and Trek doing. Yoshi can comfortably walk amongst the 6:15 dogs without issue (though in all fairness the visiting Terrier wasn't there and the Shelties weren't there, but since he sees Shelties at herding he's decided they're real dogs). And he loves Charlie the mini Aussie's dad (named Steve I think). He likes to be in his lap and lick his face like he does with Mark (Cooper's dad). Charlie's dad said that it was probably that he smelled like dog, I joked that and the facial hair might be contributing too (though Mark is clean shaven, so that really doesn't work beyond being a silly joke). Rachelle and I talked that maybe next week he could actually join the class for a few runs in the upper field (he has historically had trouble in the close quarters of the small field). That would be cool. I should probably order some citronella Direct Stop spray so that the other class members can be armed just in case. It helps that all the dogs are larger than he is. Later on after Trek was done but the other dogs were still finishing up, I brought Yoshi back out and he was with effort able to play LAT on a staring and a somewhat reactive Huskie (named Ziggy) which, for him, is quite an accomplishment. He also greeted Lynn's male BC puppy though he was pretty stiff and the puppy was a little unsure about that, so we cut it off after a bit. Trek did well at 7:30. No pooping out this time though there was a period of time where it looked like I was losing her attention. Thinking that she might be cold (it was cold for this area) I picked her up onto my lap. She loved that and perked right up. I've started using the tug and treat all the time now. It's handy to throw as a directional guide and she'll [mostly] retrieve it. It's a little large for her to easily grab so I may want to use a smaller one, but this one is rabbit fur and she loves that. In the small field she appeared to be having trouble with stopping at the 10 weave pole, after she did this twice, Rachelle pointed out that they were weaving right into a wall and other stuff. I had her weave in the other direction and she was flawless so decided not to stress about it as in competition I don't think I've ever had to have a dog weave going into a closeby wall. (And with training that may not be an issue anymore.) I'm just happy to see her weaving fast and accurately so I didn't want to demotivate her over it. And she got quite the jackpot after doing them correctly. No face plant into the A-Frame this time. No, this time she did the face plant on the landing. Ouch. I could hear everyone watching say "Ooo." She's ok, though looked a little surprised. Good thing it was soft dirt. been chronicling for the past 3+ years but I'll try. class when he nearly hurt a border terrier. It was then I got serious about finding a way to truly help him. them about Yoshi. I learned a lot, but progress was slow and hard won. it." and went on to explain that it was written for dogs like Yoshi. Then I contacted Kienan and the plan shifted to taking him down to S.
covering his eyes in a pinch, and this is where we're at right now. that if there was enough interest maybe we should bring Kienan up here. I filled the rest of the CU Workshop working spots today, one of them trying to decide between working and auditing. I noticed one very interesting thing. We started the walk when it was light but just before sunset. By the time we got back home it was twilight. As it got darker his scanning and vigilance increased. So I have my answer, night is more stressful than daylight for him. The reduced visibility doesn't help him like it does some dogs. Just faxed off 10 CU Workshop applications to Kienan. We'll see how many more I get this week. Fortunately, I wasn't deluged with entries on Monday (just a couple more), so we're in good shape and I can probably even widen our publicity a little bit if today's mail doesn't break the mailbox. Went and took photos of Washington Park to show Kienan what a great place it would be to hold privates and take photos. I'm usually just walking Yoshi around the perimeter of the dog park but it's such a cool park we should explore it further (though I've been to almost all of the park already). Kienan saw it and thinks it's a very nice park. This is a satellite photo taken in summer. It's much greener now. I took Yoshi on a walk and I don't know what got me to do this (I think just waiting for him to sniff around and adjust to being outside), but we started walking much slower than we usually do. To me walks are exercise, so readjusting to walking slower took some effort, but he was much calmer because of it. If you will, it was like a walking meditation, though my focus was outwardly directed and also focused on him, as opposed to a traditional walking meditation where your focus is on your feet and your breath, and the entire sensation of walking. We did not see any dogs but saw lots of people to LAT on. Both dogs have discovered the oranges. It's pretty funny to find an orange with a Corgi snout sized hole in it. I'll have to check to see if they're ok for them to eat. So I'm pondering Yoshi's dog reactivity (What? Again?) now that I see how well I can control it by controlling his vision. It's like the sight of an approaching dog takes a fast track into his primitive brain's EMERGENCY! panic button. That Flight or Flight reaction (though there's no flight for him any more) Both Patricia McConnell and Brenda Aloff talk about this. If I break off the visual, his forebrain takes over and sees there's no issue and he's fine. Fascinating, it's a purely physiological response, which explains why, for him, corrections really don't work as for a dog to respond to a correction, he has to be thinking, not pulling firealarms. The Collagen Punctual (tear duct) Plug that Dr. Friedman placed in Trek's eye on Sat ozzed out again last night and this morning (I checked the consistency of the discharge and it's definitely collagen), so we're backing to winky dog, the cool thing was that again for 2 days we had a dog with nearly normal eyes so if we can find a way to make it work, closing the tear duct helps a lot. We have 2 options. Dr Friedman can find silicone (instead of the temporary collagen) plugs in a size large enough for her, or she can do a surgery where they permanently close the tear duct by cauterizing it (which apparently sounds much worse than it really is) It's expensive though - ~$1200, so we'll have to save our pennies. Putting in the plugs is not that expensive so I may let her do it again though it doesn't seem like it would last very long. I was in the sits and downs ring. I kept seeing sitations that would have set Yoshi off (I don't ever see him in Open Sits and Downs - that would just be horribly stressful.). I'm glad I didn't bring him as my attention would have been split and he would have been crate reactive if I wasn't there which would have set up back in his training. It also made being there a lot more fun and I could observe the other dogs, including recognizing one potentially reactive dog whose owner I told about Control Unleashed. Some definite progress. He's still a maniac at first, not staying, charging around, crowding sheep and having Joyce yell at him to get out, to the point that Yoshi started looking at me like: "Can you do something about this crazy person?" Went back into the round pen where I was able to get a stop and sit pretty reliably. Then we went back in and initially he was still an idiot, but settled down and we were able to do actual herding - even with the distraction of having a Sheltie charge up barking to the fence we were working sheep on and refuse to come to her owner (it's a relief to have someone else's dog misbehave sometimes). He thought about going to fence fight with the Sheltie, but I was able to call him back to work with very little effort. (Hooray). Again, he's so much better behaved when he's tired. So Joyce and I decided that his first run will be in the round pen just to get the nonsense out of his system. I'm also discovering that I can read his body language really well. 80% of the time I have advanced warning when he's going to react to a dog. He stiffens, holds his head up higher, his eyes lock and his ears are pricked forward (this being the most obvious sign.) When I see that I spin him in the other direction. I averted 3 outbursts this way today. And what was cool is that it did not delay the outbursts, it avoided them entirely. Once I broke his focus, then the other dog was able to approach without incident. The treat him as a football is the most effective (tuck him under your arm and spin in the other direction (covering his eyes if necessary), but this works also. Trek's eye continues to look good. Animal Eye Care had an opening for Trek for them to check on her eye. it looks like the plug is indeed no longer there, so they put in another one. She is doing very nicely with the plug in - it's almost like we have a dog with normal eyes. Big day for Yoshi. This morning he had an obedience class with Lori Drouin. We wound up staying for two classes as the Novice class was too crowded for him to be comfortable so we played LAT while he was in his crate and waited till the Open class. Fortunately the open class was much smaller and we could work some doing some heeling and recalls and attention work. When they started working retrieves and jumping I decided rather that stress about his merely ok retrieving to instead do more LAT and Relaxation work. I didn't have his mat with me but there were two mats that I just about had to drag him off so it was clear that any mat would do so I just got the pad from the crate and we worked on relaxation there. A few days ago I realized that Yoshi really did understand "relax." When I say relax and put by hand in his collar, he relaxes and lays down (he prefers a mat but will do it on the ground.) Now I really hadn't expected him to be this far as we haven't been working on the formal Relaxation Protocol very much, but when we've done it he's been great at it. So at the club, I put the mat down in a corner and sat down beside it and he laid down next to me on the mat. Mostly he would watch with his head up but sometimes he even put his head down. Dog's were doing retrieving exercises and running right at us. He did bark one when Zanna came in with her dogs (Oliver and Barris) once he recognized the dogs he settled down it was the entrance that set him off. He was also unhappy about a GSD that was there, though I notice that if I covered his eyes that he is way better (though not perfect). So it went surprisingly well, and he's passed out from all the mental work (see photo of him using Martin as a pillow). I think he's earned the night off tonight and I'll just take Trek to agility. Several people say that he's really improved (I gave CU full credit for that), and Lori says that she can see a definite change in his demeanor. He's watching, but no longer being hypervigilant. She says that it really underscores just how much you have to constantly reinforce a dog that is unsure, and that this was very much a central tenant of Control Unleashed. I brought a CU flyer and she put it up on the bulletin board of the club and announced it to the incoming Utility Class (with Open still there). She had already told them about the book previously and said that this would be a good opportunity to watch the ideas of the book in action. Unfortunately Lori won't be able to make it as she'll be in Colorado for the Sheltie national. Trek Agility Class. This time I made sure I had really good treats (Red Barn Beef) and plenty of water (since they make her thirsty). She was much better than last time. Some sniffing, but easily called off. She did the time honored beginner face plant into the A-Frame (they all seem to do that once - Hello? you need to climb UP the thing silly. And was a little unsteady after that, but recovered nicely. Earlier in the evening she was trying to do the skip the occasional weave pole (honoring her talent as the sometime Spaz), but once she realized that we were insisting on her doing them correctly, she was fine. Speedy too. I was a little worried that evening when she didn't want to come out of the truck crate (I took the truck instead of the Scion this time) and had to drag her out. She was stiff but loosened up and seems ok. The CU Workshop is approved! Hooray! Finished a passable version of the flyer and have sent it out (Elf had some further ideas which I will incorporate, but it's tricky as I didn't write most of the text.) People on the CU_Dogs_SF list are excited about it, I'm thrilled to see that it looks like it's going to happen. At lunchtime I took Yoshi on a walk in the neighborhood as I didn't think I'd have enough time to take him to the park. I went armed with some chicken sticks to see if I could convince him that lunching was preferable to lunging (sorry). He barked at a passerby but quickly opted for the treat. Then at a corner we saw a Clumber Spaniel approaching on the other side of the street and immediately backed off 70 feet or so and commenced chicken chomping with me kneeling in front of him and my hand in his collar. He wanted the goodies but also very much wanted to hurl himself at the dog, but then he would get a hold of himself and eat (so he's not so stressed that he can't eat.) I could see him struggling internally. After the dog passed we did some parallel walking with the dog on the other side of the street but headed in the same direction (I like this and think we should do it more). Next time I'm going to try the doggles to see if that makes a difference. And Carole says she wants to come back as one of my dogs. Cathy and her dogs came over last night to watch a DVD (we're watching Dead Like Me, which is not nearly the same quality as Sopranos, or 6' Under is, but is amusing.). I was in the bathroom when Cathy rang the bell and Corgi pandemonium ensued. When I got up to the Living Room, Terri had gotten both dogs into the LR crates, and we were able to let Cathy in. (She comes in separately and sets up her dogs' crates and then goes to get her dogs. Terri said that Yoshi was completely beside himself with stress, but he seemed to settle down once in his crate. I, with treats in hand, took up my now familiar position on the sofa by his crate (a Noz 2 Noz with a zipper on the top - important), and he started nosing the top of the crate in anticipation. When Cathy came back in with her dogs, I would unzip the top a little and feed him treats. i wasn't insisting that he play Look At That but he started to do it anyway. I think i need to call the game Treats From The Sky (TFTS) as it's a little different than LAT but the same idea. He was perfect - he even took a nap later on. Everytime I knew there would be a change in the environment (like Cathy having to take her dogs out to pee) we'd play TFTS. The evening went very smoothly. I started experimenting with us having one dog out of the crate at a time to see what would happen. That proved to be very revealing. Yoshi in his crate with Abby out was watchful, but basically fine. Then we put Abby away and I had Yoshi out. All the other dogs are crated. He was ok, but stiff on the sofa with me (even with me massaging him), then we let him go over to the other sofa where Cathy and Terri were which is nearer to Cathy's dogs (still in crates). It wasn't very long till he started to growl at Abby and Jesse. When I put him back in his crate, he settled down. I could not have predicted that. Even though the other dogs were under control and not being confromtational at all he was still very uncomfortable, but another dog out and him in was ok. Even if Abby was being silly with Terri and playing on the sofa. I do wonder if I had started playing LAT with him while he was out of the crate if that would of made a difference or just covered up his emotions. I'm thinking that since the white terrier is likely to be a regular observer at the Friday agility class that Yoshi watches I'll have to bring a crate to see if that makes a difference with his comfort level around the terrier. might be something subtle (or not) going on that your dog is responding to. of humans, but not a biter (important). relaxing and you can almost hear them thanking your for speaking dog. I didn't say that if you do this and it works you will look like a genius, which is a nice benefit. The Clickerexpo yahoo group is for people who have attended one of Karen's Pryor's Clicker Expos. If you want to hang out wirh some serious dog behavior nerds this is where to go. As with Control Unleashed there's no way I can read everything and archive a lot of it for very easy retrieval. But every so often I poke my nose in and probably for the first time I see some very active disagreement in approaches to dealing with aggression in an effective positive (as in non-violent) way (violent ways usually don't acheive a change but a suppression of the behavior - my words and summarizing). The approaches I've been using are forms of Classical Conditioning to help the dog form positive associations with previously negative stimuli. Familiar terms are "Click to Calm" (Emma Parsons); "Control Unleashed" (Leslie McDevitt) or even Kathy Sdao's "Open Bar" (That's a term of hers and not a book title as far as I know.) It usually involves giving the dog a primary reinforcer (often yummy food) in the presence of something the dog reacts to. It's effective but it takes a fairly long time as you can progress rapidly in one situation but if the sitation or setting or enviornment changes then you have to practice with that change in place. Today was a day of ups and downs all having nothing to do with my dogs. After having a great day of skiing where my skill and confidence level noticeably improved, I came home and learned about 2 deaths where I knew the person and dog involved. The human was agility person Kevin Gast who was too young and too kind to die so early (of Bacterial Meningitis), the dog was Socks the Rescue Corgi that I pulled out of the Alameda Shelter who had to be put down due to aggression issues with humans and they couldn't responsibly place him even though they worked with him for months. It's interesting as when Socks snapped at me for reaching for a bone, it's almost like you could see a switch flip in his head. It was a learned physical response to a flood of adrenalin. And the bite inhibition went away which is what makes it dangerous. i wonder if we could learn from the ways we teach humans how to deal with rage issues. What if you were to teach such a dog a better alternate like biting a handy toy? Yoshi was being a twit and was not paying attention to me while he raced around after a squirrel above (he did this yesterday too). Looking around I grabbed a weave pole and started using it like a herding wand to extend the reach of my arm. He instantly responded and moved away from the pole and let me herd him into the house. Cool - multi use weavepoles.